Rental rifles are available but need to be booked in advance. We only have a small number of rentals.We regret that we cannot cater for groups of more than four rentals per game day. We are also not in a position to cater for Stag Parties, Corporate or other large groups. To ensure you aren’t disappointed please book as early as you can. 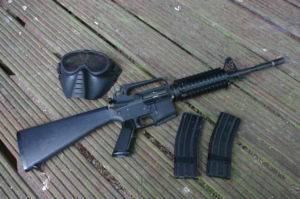 Example Rental Gun Package – M4 AEG Assault Rifle, 2 magazines and a mesh full face mask. A protective full face mesh mask. NOTE: Our rental stock changes regularly. 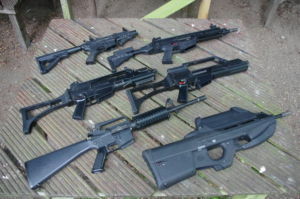 The actual rifle you rent may differ from those shown here. Please take good care of our equipment. If you damage any hire equipment; AEG, magazines or protective mask, we may retain your security deposit.